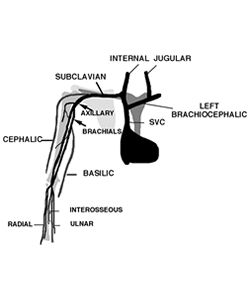 The Deep Venous system is the main return system. The largest of these veins are in the abdominal cavity. They are the superior and inferior vena cava and connect directly with the heart where the blood is promptly pumped to the lungs so it can be reoxygenated. 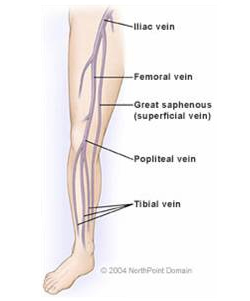 Just as it’s name implies the superficial venous system is comprised of the veins on the surface and just under the skin. These superficial or surface veins connect with the deep venous system. Most of the recent advances in the treatment of venous disease have been with regard to the treatments of diseases in this system. Varicose veins are diseased superficial veins. It is in these superficial veins that one-way or ‘check’ valves present in the veins are important to the proper direction of flow. In varicose veins, valves are not able to function properly causing blood to pool, creating distended veins.